Great dub already sounds murky, filthy and reeking of a bong hit from another planet. I’ve always been a big fan of dub as a soundtrack to long drives to nowhere in particular since the music itself seems to lack a destination as well. In addition, the German Basic Channel label and its catalogue of stoned house and electronic meanderers also provided ample company on many of these same daytrips. Therefore I was tickled pink when I discovered that Basic Channel’s main duo of Mark Ernestus and Mauritz Von Oswald were recording their own hypnotic take on dub under the moniker of Rhythm and Sound. The icing on this pot brownie was their collaboration with Paul St. Hilaire, otherwise known as Tikiman, a reggae vocalist whose laid-back delivery melded perfectly with their stoned, teutonic approach to dub. 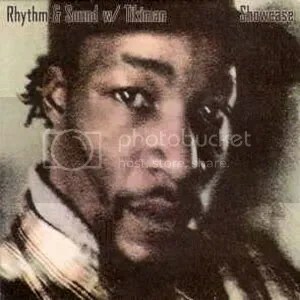 Showcase is one of their earliest works and their only full-length collaboration with Tikiman and it may be my favorite release by both parties. I love the later lps and 12’s, but this one sounds most like it was recorded underneath the ocean as each beat and gently repetitive motif reverberates out of the speakers like a wayward pinball. It is mellow to the nth degree as Ernestus and Oswald’s compositions are almost narcoleptic in that they minimal to point where they almost threaten to fall apart into nothingness. There is a subtle, plodding bass that holds it all together, but Tikiman’s vocals are deconstructed and diced until they are sometime just used as accents instead of showpieces. However, Tikiman shines in his own sleepy manner when he strides to the forefront, but it serves best as a quick contrast to the echo and swirl of most of the album. 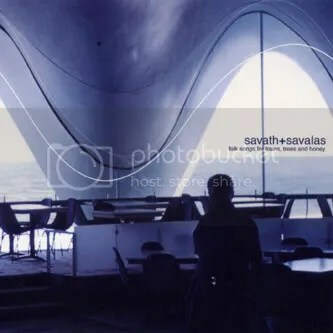 Sometimes music can swing and groove from the sparsest of sounds and it is a testament to all involved that such a minimal album hits that sweet spot where the listener can do little but nod along to every single note. As an added bonus, I am posting one of their later 12’s. I’ve never really delved into the reissue program of the Wackies label releases, but probably should do so since it has been overseen by Basic Channel/Rhythm and Sound innovators, Mauritz Von Oswald and Mark Ernestus. I’ve liked most of what I’ve heard thusfar, especially the Sugar Minott album, Wicked Ago Feel It! 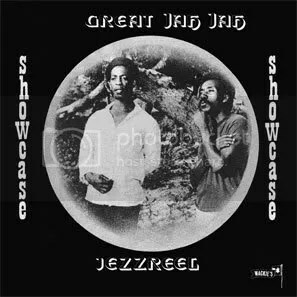 When I saw that Jezzreel consisted of Minott’s longtime collaborators, Clive Davis and Christopher Harvey, my interest was piqued. A few months ago, I saw a cheap copy for sale and figured that I’d take the plunge. This is a bit more drugged and dub-influenced than the few Minott albums I’ve heard and I think I may prefer Jezzreel’s eccentric harmonies and bizarro rants about the Roman empire over Minott’s more accessible approach. However, if anyone is able to tunr me onto some deep Minott excursions, I’d be greatly indebted to you. Great Jah Jah possessed all of the trademarks of the Wackies label with its mix of angelic harmonizing, hypnotic basslines and and an eccentric streak a mile wide. In fact, Rhythm and Sound’s modern update of dub doesn’t sound too far removed from this 1980 gem. The highlight of Great Jah Jah is “Roman Soldiers” which seems to be an anti-imperialist rant that threatens the wrath of Jah upon colonial oppressors. On the other hand, it is a dense track with what sounds like a dying melodica being abused in the background as the nimble basslines snake all over the goddamn place. A less claustrophobic air pervades the rest of the album as elements of doo-wop lover’s rock take the forefront and the album takes a more laid-back narcotic path as everything is phased to high heaven. I really dig the guitarist’s work on this album and possibly enjoy it even more since he goes by the moniker of Reggae Jerry. Sure, there are better dub and reggae albums in this wonderful world of ours, but this one just sounds perfect on this humid evening and it seemed fitting to share with you even if it is cold and damp in your corner of the planet.